USA Today posted an article and a preview clip from the upcoming Clone Wars bonus material. The clip focuses on the mystery of Syfo-Dias and stars none other than Plo Koon. In the article, Filoni mentions that he is working on completing these bonus arcs. When and where are we going to see these arcs? How many arcs are we going to see anyway? What are they? What about the unaired Clovis arc that got booted from Season Five? Rumors say that most of Season Six was completed before the ax officially fell. If true, why not just produce a full Season Six then? To celebrate the faux holiday of May the 4th, Amazon is putting on sale its (separate) trilogy Blu-Ray sets for a mere $32.99. If I didn’t already own the Complete Saga set, I’d buy ’em at that price. Both of course! Look under Blogroll on the right side of the page…I’ve added Semper Neimoidiana and its affiliated sites plus an Anakin/Padmé-themed Tumblr called You Are In My Very Soul. There’s some cute artwork too. My Padawan Obi-Wan 1/6 scale figure from Sideshow Collectibles arrived a couple of weeks ago, but I don’t have the time or the inclination to take a bunch of pictures of it (besides he’s boxed up and stored at my office…I’m moving). Fortunately somebody at Rebelscum did. The figure really is as sweet as it looks in the picture. Pick one up today! I love that the cake decorator made the effort to put that blue thing in the background, but not to write the name of the show correctly or otherwise display any pizzazz. Somehow I forgot to post a link to Adam’s essay from 4/18, Anatomy Of A Scene: Grievous Challenges Kenobi. In it he explains in great detail why the scene was set up the way it was (I never had any problems with it and in context of The Clone Wars, people shouldn’t have any problems with it at all). First off, Kenobi is a Jedi trained to not let his emotions get the better of him. When he moves, he moves deliberately and without letting fear take him. Any Jedi worth his salt would do the same, as Grievous wears in his cloak proof of what happens when you don’t. And as for a non-Jedi character who would be scared pantsless? They’d be deer-in-headlights frozen for at least a moment before screaming to the hills. And it reminds me of when Hayden was once asked to consult on the ROTS video game. He told the game designers that Anakin would never walk around all tense with a lightsaber in his hand because he’s always ready. Jedi are kinda like that, you know ;). From 10am to 1pm, New York Jedi Masters will host 30 minute Jedi training classes showcasing light saber techniques and moves made popular in the famous film series by George Lucas. Classes are free with paid admission and each Jedi-in-training will receive a lightsaber and a Saber Academy certificate upon completion. Online class registration is available now through May 2 at http://www.ripleysnewyork.com. Space is limited; participation will be confirmed in the order that it is received. The first 15 fans to register will receive a free Ripley’s gift bag. Throughout the Odditorium, guests will be greeted by Ripley’s staff dressed as knights and dark lords, witness live lightsaber duels by New York Jedi members, and have the opportunity to take pictures with the Jedi Masters. Under the front marquee, prospective Jedi Knights can test their Star Wars knowledge with a series of trivia questions, such as famous quotes, name that character, heroes and villains, and more. Guests who answer correctly will receive 20% off admission. The BTVA Voice Acting Awards has nominated James Arnold Taylor, Ashley Eckstein, Corey Burton, Nika Futterman, and Sam Witwer for their roles on The Clone Wars. David Tennant is nominated for his guest shot on the show. Moreover, the cast is nominated as an ensemble. 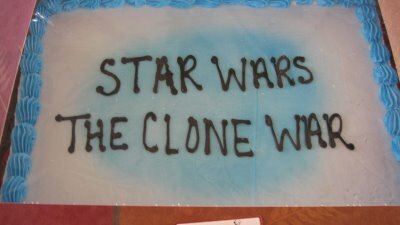 What a great message it would send if we scored as many wins as possible for our Clone Wars crew. Be sure to vote! You are currently browsing the blog archives for April, 2013.